Counting with units – counting by 2’s, 5’s or 10’s , for example – is a counting skill that is usually developed well after physical counting, figurative counting, and counting-on. It is a skill that many first-graders do not yet have, and will likely take some time to develop. Our book Kids Count! explains the background to unit counting and how you can assess if your child is at that stage of counting development. This exercise follows a couple of others in which the figures represent just 1 thing. 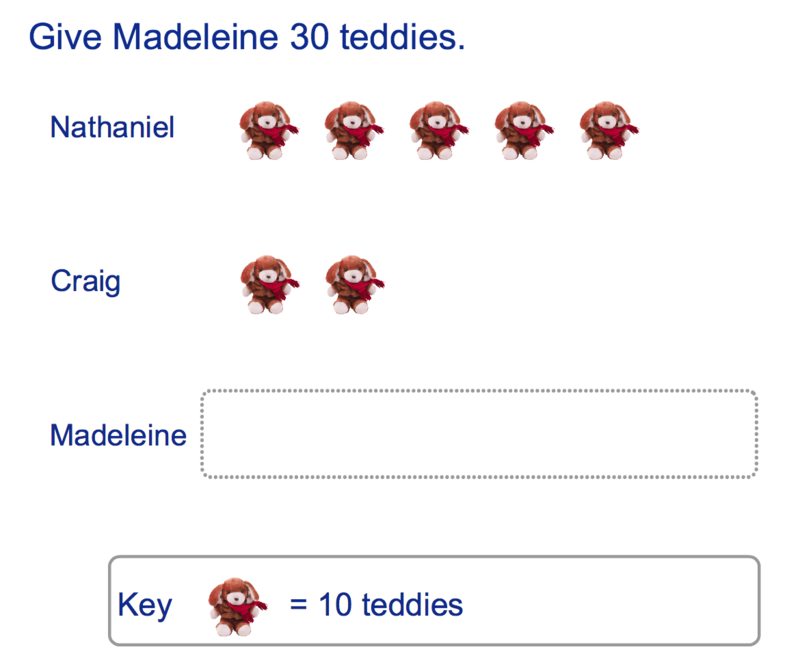 In this exercise each figure represents 10 of something – 10 teddies. A first grader who is still at the physical counting stage, who needs to see or touch the things they count – which is the case for many first graders – will not easily, or at all, be able to reconcile one of the figures as a stand-in for 10 teddies. We feel the exercise above from mathletics.com is bound to confuse many first graders. In our experience, focusing on getting the basics right in grades 1, 2 and 3 is absolutely critical to a child’s developing sense of number and arithmetic. The little girl in the video below is absolutely adamant that her dad – a teacher – has got it wrong when counting to five. No amount of telling her she’s wrong has any effect. Only when her mother asks her to count to 4 does she get it right. The moral? Arguing is a waste of time and effort – just do what the momma does: ask the girl to do something you know she can get right. When Corina Silviera was working toward her PhD at the University of Southampton in the UK she came up with a written number recognition game. Corina chose a small group of 5 year olds to play a game with these cards. First one of the children shuffled the cards and dealt 4 cards to each of the children present. Then the children took turns in laying down one of their cards. The winner of a round was the child who laid down the highest number card. An important aspect of the game for Corina was to let the children figure who won: her aim was to understand how they knew which card had the largest number. Of course there’s an element of strategy in this game in that if someone lays down a card that’s larger in number than all your cards then, to optimize your chances of winning future rounds, you should lay down your lowest numbered card. However, generally the children did not do this. The child who put down the card with the number 62, scooped up the five cards and declared he had won the round. “Because there’s a 6”, said the boy who scooped up the cards, pointing to the 6 in 62. This was an example of the regularities in children’s engagement with numbers, even those they could not name, that Corina was seeking to uncover. None of the children in the group knew that “69” was read as “sixty-nine” nor could most of them count that far, yet they had picked up on a regularity in the place value representation of numbers in the adult world. Sally is at the beach with her mother, Marion. Sally is 3 years old and she and her mother are going to make sand-castles. As they walk down the stairs to the beach, Marion asks Sally if she can count the stairs. Carefully, Sally says the number names “one”, “two”, three”, … as she puts each foot on a new stair. Saying the number names in order – “one”, “two”, “three”, “four”, “five”, … – is the most important first step for a child to learn to count. In the beginning a child’s success is dependent on their experience in saying number names in order. Their ability to remember the number names in order is very much like learning the alphabet. Just as Sally and her mother counted steps, there are many everyday opportunities for children to practice saying the number names in order. In our experience children will happily show you how good they are at counting. For example children can, and will, practice counting at breakfast, in the car, on the way to school, coming home, at meals and snack times, and in the bath at night. Just a couple of minutes of your time each day listening to them count will help your child become more skilled at saying the number names in order. The number names are what a child builds upon as they progress from physical counting of things they can see, hear, or touch, to more powerful forms of counting. All children first need to count physical objects: things that can be touched, seen or heard, that can be picked up and moved, or repeated, such as clapping sounds. Physical objects include things around the house, for example, apples, toys and cookies. Physical objects also include things outside the house for example, leaves, rocks and shells. At school children will use physical objects such as counters, blocks, and popsicle sticks. For your child to be a successful counter of physical objects they need to be good at reciting the number names in order. The basis of counting is that we match up one collection of things with another: cookies with children, for example. Paying careful attention to how your child counts is important: how they track, what they touch, what they say. Try to record as much as you can remember in a diary. The diary entries help you begin to see more clearly what it is that your child is doing as they count. This knowledge is essential as you help them develop more efficient types of counting. As children progress in their counting development they reach a point where they are able to count-on from a given number. “Jack, can you see 8 crackers on the table? How is Jackson able to do this? 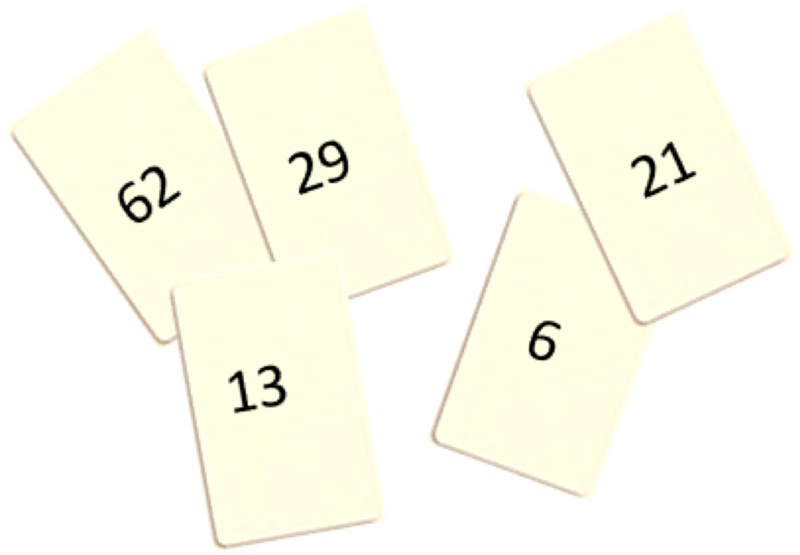 What has happened in his counting development that allows him the flexibility to begin counting-on from eight, and recognize how many more times he counted to get to thirteen? Jackson’s father notices that as Jackson counts he moves his jaw from side to side. He thinks Jackson counted how many times he moved his jaw as he said “nine, ten, eleven, twelve, thirteen”, and so concluded that 13 is 5 more than 8. Jackson is at the very beginning stages of learning how to count-on. He uses body movements, coordinated with saying a number that does not begin at “one”. He seems to count his body movements as he does this. Jackson has to focus his attention very carefully and coordinate two sets of movements: his speech and his jaw movements. He seems to count the movements of his jaw. But he is doing much more than that. He begins saying part of a number sequence, beginning at “nine” – the point he would have been at if he had counted from “one” through “eight”. This indicates he can extract a number like “eight” from the sequence of counting numbers and begin his counting from there. Children, like Jackson, who count-on have made a huge advance in counting, They are flexible with regard to where their counting begins. Children who can count-on will also use counting-on to solve addition problems. For example, a child who can count-on will typically answer a question such as “What is 7 and 4 more?” by counting-on from “seven”: “eight”, “nine”, “ten”, “eleven”. At first, children count-on to solve addition problems by starting from the first number presented to them: for 3 + 7 they will typically begin by counting-on from 3. Only later, as they have mastered this aspect of counting-on, will they begin by counting-on from the larger number. It sometimes seems that children who are only just beginning to count-on are still focusing on images of objects to be counted, such as marbles, counters, or jelly babies. However we see with the example of Jackson, and other children who tap their fingers when they count-on, that sometimes children who count-on are focusing mainly on body actions. That is, the children make body actions such as tapping, moving their jaws or eyebrows, or biting their lips, as they count-on. It may be that they do not have visual or other concrete images in their minds. Rather, they may be focusing on keeping in memory the number of taps or bites they are making. When a child can count-on, a number such as “eight” has two meanings. First, it is the number in sequence immediately following “seven”. Second, it is now a trigger for a memory of having counted “one, two, three, four, five, six, seven, eight”. For a child who can count-on, a number name such as “eight” brings to mind these two sorts of memories. The first is a memory of “eight” as following “seven”. The second is a memory of “eight” as being the last name spoken in a sequence beginning with “one”. Counting-on is a sure sign of developing flexibility in a child’s counting development. It is not something that can be explicitly taught, as such: a parent or teacher can help a child develop this level of flexible counting through appropriate activities, carried out over a period of time. We will write about what these activities might be in a follow-up post. Counting-on is such a strong indicator of flexible development in counting that Eddie Gray, then at the University of Warwick in England, described it as “the parting of the ways”. By this, he meant that the divergence in counting ability between children who can count-on, and those who cannot, is so significant that a child’s later number sense can be impacted. Counting-on is a highly significant counting ability, yet it cannot be taught through explicit instruction, so a deeper understanding of how a child develops this flexible ability to count is critical for parents and teachers to understand. Read Eddie Gray’s original research.